Dr. Jeff Dahm is a 1987 graduate of Dordt College in Sioux Center, IA. He graduated the University of Iowa, College of Dentistry in 1991 and completed a residency program at the University of North Carolina in 1992. After completing his residency program, he joined Dr. Jim (Dr. Jeff's dad) in practice in 1992. Dr. Jeff is a member of the American Dental Association and also a member of the American Orthodontic Society. In 2015 Dr. Jeff was awarded “Outstanding Ortho Case of the Year”. In April of 2017 he received the "Diplomat" Award from the American Orthodontic Society for academic achievement and clinical proficiency. It is an award that less than 5% of AOS members have achieved. 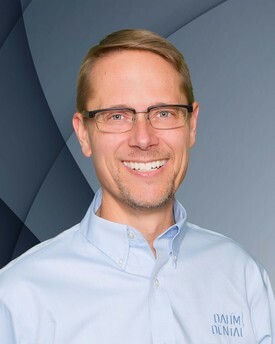 Dr. Jeff’s passions include developing beautiful faces and smiles and healthy and stable bites in the growing child as well as correcting and restoring broken down teeth and bites from a lifetime of wear and tear. Dr. Jeff's personal experience with sleep apnea has given him a passion to help children and adults who unknowingly suffer the same problems that he did. Dr. Jeff is a constant learner and seeks the best continuing education to help better serve his patients. Dr. Jeff loves “giving back” personally with dental service projects. He has served on several dental projects in Mexico and taught paramedics about dental care, how to manage dental infection and how to safely extract teeth. He currently is giving back by providing dental care to orphans in Cambodia and as a business, supports the "Smile Train" organization, which provides complimentary cleft lip and palate surgeries to peoples of the developing world. "My goal is to treat you with the utmost respect as a person and as a patient of our Pella dentist office. We encourage open and honest conversations regarding dental health care and any special needs that you may have. We strive to provide the highest quality of dental care available, while avoiding treatment fads and gimmicks. We want our work to be beautiful, long lasting and feel natural to you. I believe it is a privilege to be your choice of Pella dentists and it is my goal to provide you with the same care I would desire for my family, my staff and myself.